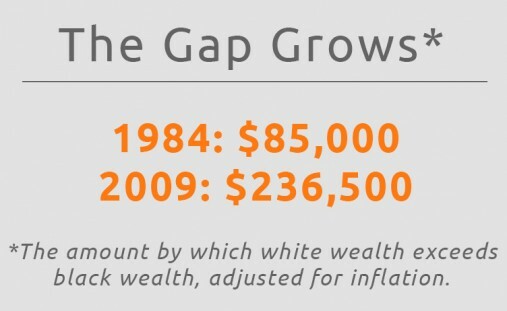 Over the past 25 years, the difference in wealth held by white and black households in the United States has nearly tripled, to $236,500. In December, Squared Away wrote about the difficulty that black families have in trying to accumulate wealth so they can pass it on to their children. 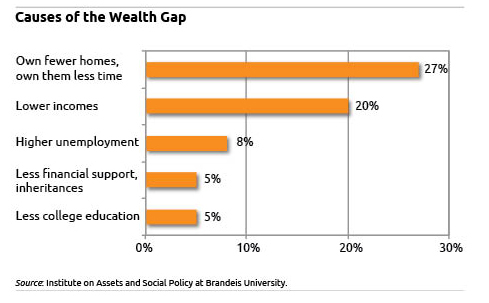 New research out of Brandeis University’s Institute on Assets and Social Policy now finds that the gap between the median net worth for white and black households has widened to a chasm, as blacks have fallen farther behind. The study also quantified the reasons for the widening gap and found that the difficulty of building up housing equity is the largest factor. A house is usually the single largest asset owned by middle-class American families. But starkly different homeownership patterns between blacks and whites – ownership rates are lower for blacks, who also own their homes for fewer years than whites – accounted for 27 percent of the increase in the wealth gap. Housing’s impact has been “incredibly large” and is the “key driver” of the growing black-white wealth gap, said Thomas Shapiro, the institute’s director. “It’s part of the disadvantage that keeps working its way through the life course” from one generation of a black family to the next, he said. It’s more difficult for blacks to accumulate housing wealth for several reasons, all of which work to widen the wealth gap. For example, since homes in the neighborhoods where they live tend to appreciate less, blacks have less home equity, Shapiro said. “The ceiling on home equity gets lower and lower” in more diverse neighborhoods with lower house prices, he said. The nitty-gritty of getting a mortgage also works against blacks. Prospective white homebuyers have more access to gifts from family members to make larger down payments, which can lower the interest rates on their home loans, he said. Black families are also more likely to lose a home in foreclosure, a factor that played out dramatically in the aftermath of the subprime mortgage boom. The institute’s dramatic findings were taken from a national survey – the Panel Study of Income Dynamics – that follows the same households over 25 years. They are interviewed roughly every other year to create generational data. Differences in educational attainment play a smaller role, explaining about 5 percent of the increase in the wealth gap. A college degree translates to greater wealth and income after a graduate begins working – by one estimate, college graduates earn $1 million more than do high school graduates. But while black and white families are both completing college at higher rates than they did 25 years ago, black graduation rates are not keeping up. “It is clear that differential educational opportunities and rewards are further widening the racial wealth gap,” the study concluded. This is a very depressing study. There may be a tiny ray of hope: White families had net worth 15.7 times that of black families in 1984, but that ratio had shrunk to 9.3 times in 2009. The shrinking ratio is a ray of hope. A key problem is that so many provisions intended to help increase education, home ownership, and retirement savings are biased for the Haves, not the Have-Not-Yets. Education loans have opened doors to college, but they also have allowed big increases in the cost of college, and hence of educational debt (particularly for those with lower incomes and wealth). Tax favors for owner-occupied homes have disproportionately helped those of upper middle incomes, driving up the price for homes for others less able to use the tax benefits. Tax-incentives for retirement savings are much greater a help and an incentive for the those with higher incomes and who are closer to retirement. These are among the topics we should address in working to ameliorate the increasing wealth and income inequality in our nation. This is sad, sad, sad. For most middle class people, working and saving out of income is the only realistic method of wealth creation; the USA has not seen real income growth since the mid-70’s, so the small difference in wealth between races is not in the least bit encouraging. For many reasons, it is the inability to save which is the greatest impediment to growth. But since Social Security is for most people, the only wealth they will have in a lifetime and the only retirement income, it is imperative that it be reformed to encourage greater personal savings and offer savers a real and positive rate of return, tied to their own incomes. A rising income AND a rising savings account is what creates the Wealth Effect, giving people confidence to work, save, buy homes, and start businesses. But the government knows better. The American economist, social theorist, political philosopher, and author, Thomas Sowell, wrote a book (I believe it was titled the Housing Boom and Bust) in which he looked at wealth of black people vs white people. He found that it didn’t correlate to income, i.e. even though two couples may make $100K each, the spending and investing patterns are different, so in their 50’s that have very different totals for accumulated wealth. For what it’s worth, Sowell happens to be black, but this wasn’t the focus of the book. I agree with the comment above that this is a very depressing study. Wealth creation and retirement saving are concepts difficult to embrace by the Have-Not-Yets. Many of them struggle with the day to day survival. And it is hard to envision the future. Schools are not teaching low-income kids how to deal with their daily problems, while at the same time creating a vision for the future that will improve their circumstances. In my humble opinion, the teaching of self-empowerment is much more important than simply knowledge in this case. With the likes of Obama and Oprah, this surprises me. My experience with discrimination is related to initiatives to help with employment in the U.S., especially among minorities with criminal records. Not only is it harder due to discrimination to get a job, but if a minority also has a criminal record, it then becomes next to impossible to get a job. There are some good videos on being ‘boxed out’ that addresses discrimination, including irrelevant discrimination (i.e. a person has an impaired driving conviction 15 years ago but applying for a job in a bank – the two are unrelated and as a result the record should not result in discrimination). I have to believe it is getting better and that the economy has only created a short-term lag in this area. I’m glad this is getting the attention it deserves. I hope it improves. Thanks for posting. The Canadian Legal Resource Centre Inc.
Lots of very thoughtful comments here — this is clearly an issue of interest to many readers. I’ll keep my eye out for more articles on this topic in the future!